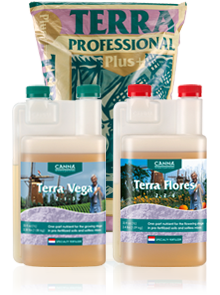 CANNA TERRA is specially developed for growing plants in peat based potting mixes. Growing in potting mixes is easy and ideal for inexperienced users. However, it can be difficult to have precise control of the dosage. Luckily, CANNA TERRA nutrients have been developed to easily give good results with pre fertilized mixes, both indoors and outdoors.